View More In Automotive Seat Protector. ★Aoafun kick mats use strong 600D Oxford cloth. ★Size: 25.6*18.1inch. It's large enough to cover the backs of the front seats very well. ★No more dirty shoe prints on the back of the seat. ★Suitable for most of cars and SUV. Easy to fit. ★You can use the mesh bags at both sides to store drinks, umbrellas and etc. And you can use the zipped bottom pocket to store books, magazines, snacks and etc. ★Easy to Clean,This kick mat was made by waterproof material,You can easily wipe out the mud. ★ Fits on the seat of Most Vehicles. ★ Non-Slip Designed to prevent your baby's forward or rear facing car seat from slipping. LARGE COVERAGE: Fit to most vehicles with the measurement - the seat: 18 x 19 in ch ( 45 x 48 cm ), the back: 18x 23 inch ( 46 x 59 cm ) and the mesh is 14 x 3 inch ( 34 x 19 cm )，Meet more than 90% of automotive installation needs. HIGH QUALITY - AOAFUN auto seat back protectors is very long durability due to extra strong seams and high quality material. Waterproof backing protects the car seat upholstery from liquid spills and stains. 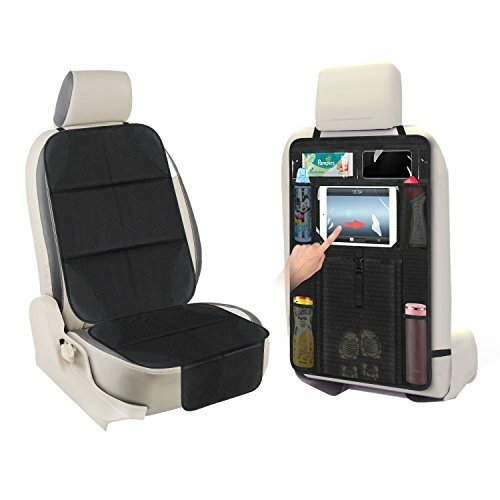 PRACTICAL BAGS: A transparent window pocket for the iPad, 10.6" Touch Screen Tablet Pocket, transparent PVC pocket with good angle, you can operate your iPad directly, gives your rear passengers or kids the freedom to watch their favorite movie while keeping their hands free. Package Content - 1 pack AOAFUN Backseat Organizers&1 pack AOAFUN Car Seat Protector .Now,you can enjoy zero-Risk Purchase, all of life 100% Satisfaction Guarantee and Our Friendly Service - 24 hours email customer service response.